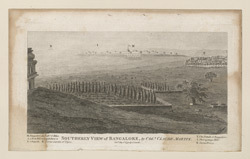 Engraving by Claude Martin, from an earlier drawing of a southerly view of Bangalore in Karnataka, published by J. Sewell in 1792. In the late 18th century, the Muslim rulers Haidar Ali (r.1761-1782) and his son Tipu Sultan (r.1782-1799) fought numerous wars against the British over the control of Southern India. The fort at Bangalore, which is shown in the background of this view, was captured by Lord Cornwallis and his army on 21 March 1791. Although the fort was originally built by the founder of the city and Hindu ruler Kempe Gowda in the early 16th century, it was strengthened by Haidar Ali in 1761. The 18th century fort was oval in shape and had eight gates, only one of which survives today. In the foreground of view, we can see the 'Cypress Gardens' at Bangalore. Now known as the Lal Bagh Botanical Gardens, they were originally laid out by Haidar Ali.